With its colorful rocks and towering peaks, central Utah is a land of beauty. Much of Utah’s beautiful sandstone also acts as a major petroleum reservoir. Photograph is by Ron Nichols, USDA Natural Resources Conservation Service. Increasing prices of oil, natural gas and gasoline as a result of worldwide rising demand for petroleum and instability in many oil-exporting countries has motivated industrial countries such as the United States to diversify their energy supplies. One such approach is to increase domestic petroleum exploration and production. This is particularly attractive in the Rocky Mountains basins, which are classic petroleum-producing provinces in the United States. Petroleum exploration and production in Utah dates back to the 1890s. The majority of petroleum fields are located on the Colorado Plateau in eastern Utah. According to data compiled by the Utah Geological Survey in 2005, Utah holds 493 million barrels of proved oil reserves (about 1.9 percent of the total U.S. onshore oil reserves) and 4.3 trillion cubic feet of natural gas (about 2.20 percent of the total U.S. onshore gas reserves). Utah’s oil reserves and production have undergone major changes in recent decades. Since 1960, proved reserves of liquid petroleum in Utah have increased notably because of discoveries of natural gas liquids. Oil production, though, which peaked at about 40 million barrels in 1985, has since declined significantly. Overall U.S. oil production peaked in 1970, so declining oil production is not unique to Utah. The disparity between increasing reserves and declining production, however, deserves close attention. “Proved reserves” is not a fixed quantity but an estimate that can vary depending on economics, geologic knowledge and technology. If the increased reserves of oil in Utah are due to improved knowledge, then it seems that production has not kept up with it. This may have a variety of explanations, including the occurrence of oil reserves in wilderness areas and national parks, the aging of oil wells and a decline in drilling activities in Utah, especially after the 1985 world oil market crash. Utah’s gas reserves and production, however, paint a different picture, and have significantly increased over the past five decades. Since 1999, as oil and gas prices have increased, Utah has seen more active petroleum exploration. The number of drilling permits issued by the Utah Division of Oil, Gas and Mining has increased from 339 in 1999 to 1,630 in 2005. The number of drilled wells has increased from 283 to 889 during the same period. Petroleum exploration in central Utah, however, has been slower in coming. For decades, exploration had been unfruitful. But in 2003, a new oilfield, called the Covenant field, was discovered and has renewed interest in petroleum exploration in this region. Utah is divided into four broad geological regions: the Colorado Plateau, the Central (Middle) Rockies, High Plateaus (Transition Zone), and the Basin-and-Range province. The nature of Utah’s petroleum basins vary between these tectonic provinces. The Colorado Plateau in eastern Utah extends to the nearby states of Colorado, New Mexico and Arizona, and formed as a result of a major tectonic uplift called the Laramide Orogeny, 65 million to 40 million years ago. The famously picturesque red sandstone country carved by large rivers is located on the Colorado Plateau, as are major petroleum basins, including the Paradox, Uinta and the Wasatch Plateau basins in Utah. Indeed, the first oil well drilled in Utah was on the Colorado Plateau in 1891 — it reached about 300 meters deep but produced no oil. 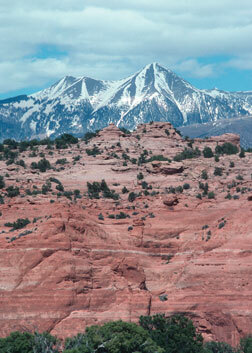 The Paradox Basin occupies a part of the Colorado Plateau in southeastern Utah and southwestern Colorado. In Utah, the basin is about 240 kilometers long (north-south) and 120 kilometers wide (east-west). The Aneth oilfield in southwestern Utah, estimated to contain 0.5 billion to 1 billion barrels of oil, is the largest field in the Paradox Basin. Green represents oil-producing fields, with red representing gas-producing areas in Utah and its neighbors. 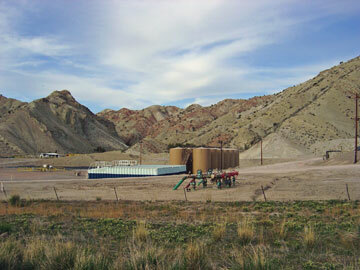 Utah’s oil and gas production is increasing. Image is by of Rasoul Sorkhabi. The majority of reservoirs in this basin are limestones and dolomites of Mississippian to Permian ages. The oil originated from the organic-rich mudstone and black carbonate rocks of the same age. The Cretaceous-aged Ferron Sandstone Formation is another important reservoir with oil that originated from the Cretaceous-aged Mancos Shale. Folding and faulting of sedimentary layers by the movement of underlying Pennsylvanian-aged salt has created important structural traps, although stratigraphic traps also provide oil accumulation sites, especially in the Aneth field. According to an assessment by the U.S. Geological Survey (USGS), the Paradox Basin in Utah alone contains 196 million barrels of oil resources and 487 billion cubic feet of gas resources yet to be discovered and produced. The Uinta Basin in the Colorado Plateau in northern Utah formed in front of the Uinta Mountains — an east-west range that rose 65 million to 40 million years ago. The Uinta Basin is about 190 kilometers long (east-west) and 160 kilometers wide (north-south) and is a deep basin with sediments more than 9 kilometers thick. Several petroleum systems of varying ages occur in the Uinta Basin, as the basin holds thick sandstone reservoir rocks as well as petroleum source rocks of Jurassic-Paleocene age. Older and deeper sedimentary rocks are relatively less explored. According to USGS, yet-to-be-discovered petroleum resources in the Uinta Basin may include up to 77 million barrels of oil and 14.4 trillion cubic feet of gas. The Wasatch Plateau, which holds important gas fields, covers an area 130 kilometers long (north-south) and 40 kilometers wide (east-west). Cretaceous-aged Ferron and Dakota sandstone formations deformed by faulting and folding are the main producing reservoirs in these fields. The plateau is not known to host commercial accumulations of oil, but there may be oil pools at deeper levels of the basin. The Central Rockies are spectacular mountains in Wyoming and northern Utah that formed by major thrust faults in the Sevier Orogeny 100 million to 50 million years ago. Foreland sedimentary basins from this mountain-building event are thus located between large thrust faults, of which the Absaroka Thrust province is most notable for oil and gas. This thrust fault spans 320 kilometers from Jackson Hole in northern Wyoming to Summit County in northern Utah, where it is about 80 kilometers wide, from east to west. The Pineview oilfield, discovered in 1975, and the Anschutz Ranch gas fields, discovered in 1979 in Summit County, still rank among the most important discoveries in the Rocky Mountains basins in recent decades. According to USGS, yet-to-be-discovered resources in the Absaroka Thrust province are about 87 million barrels of oil and 243 billion cubic feet of gas. Western Utah sits within the Basin-and-Range province, which formed over the past 35 million years as a result of stretching and thinning of the continental crust. This “extensional tectonics” was associated with igneous activity and created numerous small basins and valleys bounded by normal faults. As such, higher rates of heat flow in this region and the existence of fault structures should provide ideal conditions for generation and accumulation of oil. Exploration and drilling of many wells in the Basin-and-Range province, however, have not proven fruitful, probably because sedimentary rocks containing rich organic material have not been buried and heated sufficiently to generate petroleum, or, where they may have done so, active tectonics has destroyed the petroleum accumulation sites. The High Plateaus of Utah are a transitional zone from the Colorado Plateau on the east to the Basin-and-Range province on the west. The region largely includes the central Utah fold-and-thrust belt formed by the Sevier Orogeny and is thus a continuation of the Central Rockies in northern Utah and Wyoming. Oil was not discovered in this region until 2003. The discovery of the Covenant oilfield in December 2003 was a Christmas present for Wolverine Oil & Gas Company, a small independent oil company based in Michigan. Wolverine took over an area that Chevron and other major oil companies had abandoned. The news of Wolverine’s oil discovery, however, was encouraging enough for other oil companies to rejuvenate exploration activities in central Utah. Wolverine drilled a second well in the same field in 2004 that was also productive. In all, 10 wells now produce close to 7,000 barrels of oil per day from the Covenant field. In 2003, Wolverine Oil & Gas Company discovered the Covenant oilfield, with the test well shown here. The hills in the background are composed of the Arapien Shale, which acts as the cap (seal) rock for the petroleum field. Photograph is by Rasoul Sorkhabi. The recoverable reserves of the field are estimated to be about 200,000 barrels. The Covenant field is similar to the Pineview and Anschutz fields in northern Utah. Oil is produced from the Jurassic-aged Navajo sandstone and it is accumulated in a fold structure created by thrust faulting. The Arapien Shale, a very thick unit of shale, gypsum and salt, has provided the cap (seal) rock for the petroleum. The oil source rock is believed to be Mississippian sediments at deeper parts of the basin. The Central Utah fold-and-thrust belt stretches for about 290 kilometers north-south and is almost 100 kilometers wide. The area has several large thrust faults and contains a thick sedimentary pile, including Navajo Sandstone and Arapien Shale. Geologists estimate that up to 1 billion barrels of oil may exist in the region. The Covenant oilfield discovery has been highly publicized as the most important oil discovery in the Rockies over the past 25 years. Indeed, land leasing prices in central Utah have increased from less than $10 an acre prior to this discovery to more than $1,000 today, creating a local oil rush. In addition to a good amount of traditional oil and gas resources, Utah also contains vast reserves of unconventional petroleum resources. For example, shale oil in the Eocene-aged Green River Formation is a notable resource. (The Green River Formation is a carbonaceous mudstone with abundant organic matter that can be heated to generate oil.) USGS estimates Utah’s oil shale reserves at close to 500 billion barrels of oil — second only to Colorado in the United States. Utah is also estimated to contain 20 billion barrels of oil in oil sands, or tar sands — ranking number one nationwide. 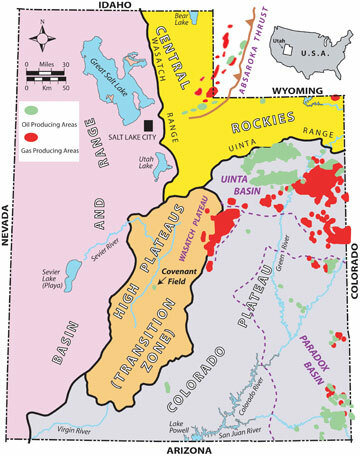 Furthermore, the Uinta Basin contains one of the largest concentrations of coalbed methane and tight (low-permeability) sandstone gas in North America. If petroleum prices and world demand for oil and gas supplies continue to rise, Utah’s unconventional hydrocarbon resources will become economically more attractive. Under the current economic and technological circumstances, tight sandstone gas and heavy oil resources are more feasible to be developed than oil shale and tar sands. Nonetheless, the Energy Policy Act of 2005 has directed the Bureau of Land Management to investigate the potential of oil shale and tar sands in Colorado, Utah and Wyoming for a new commercial leasing program. Aside from economy and technology, the major challenge to exploit these resources is environmental. With growing concerns about global climate change, unless the problem of carbon dioxide emissions from burning fossil fuels is resolved — either by sequestering carbon dioxide or by decreasing our consumption of fossil fuels — adding the unconventional hydrocarbon resources to our production and consumption of petroleum will not be an easy task. Moreover, there is also potential damage of large-scale petroleum industry activities to Utah’s natural landscape and wildlife. Indeed, Utah prides itself as a home to considerable areas of wilderness, national parks and Native American cultural reservation areas. A major challenge thus exists as to how to develop Utah’s petroleum resources (major revenue that the state and petroleum companies welcome) but to avoid the destruction of Utah’s environmental treasures. Currently, some state agencies and environmental groups are pursuing plans to safeguard Utah’s wildlife and environment. But balancing the environmental concerns and the growing potential of uncoventional hydrocarbon resources in Utah will become increasingly challenging. Sorkhabi is a research professor at the University of Utah’s Energy & Geoscience Institute. E-mail: rsorkhabi@egi.utah.edu.